Often people look for names with a certain sound, a certain ere, a certain letter. If you want a name with a fantastic meaning behind it and history Greek Gods and Goddesses may be just the place to start looking. Some of these names previous I had not heard of and am truly falling in love with. Zeus (Zoo-s)is the god of the sky and ruler of all the Olympian gods. Lord of the sky, the rain god his weapon is a thunderbolt. The name Zeus means living. Hades (Ha·des) is the the brother of Zeus and was Lord of the Underworld ruling over the dead. He is also God of wealth due to the precious metals and jewels underground. Hestia (Hes-te-a) is the sister of Zeus and is the God of Hearth, a symbol of the house. In cities there were fires dedicated to Hestia never allowed to be extinguished. This is so children would enter the house and family safely. Hera (HARE-ah) wife of Zeus she is the Greek Queen of Heaven, due to her husbands infidelities was often names goddess of marriages. Aris (A-Ris) is the son of Zeus and is the God of War, disliked by both his parents. He was thought of as blood stained and a coward. Athena (a-THEE-nah) is the daughter of Zeus and Greek virgin Goddess of reason, intelligent activity, arts and literature. She was Zeus's favourite child and so was permitted to use his thunderbolt. She is also supposed to of invented such instruments as the bridle. Apollo (Ah-POH-loh) is the son of Zeus and Leto. His twin sister being Artemis. He is the God of music and the god of healing, teaching man of medicine. He is also the God of truth and light. He drives the sun chariot across the sky. Aphrodite (Af-ro-die-tee) is the Goddess of love, desire and beauty. 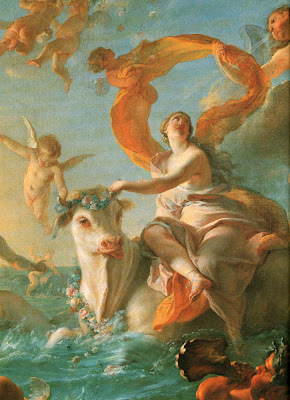 She was said to have been born from the sea foam so Aphrodite also translates to mean 'foam'. Hermes (HER-mees) was the most intelligent of Olympus Gods and was the messenger for them. The fastest of all Gods he was the son of Zeus and Maia. He is also the god of thieves and commerce, the guide also for dead in the underworld. Artemis (AR-te-miss) is the goddess of chastity, virginity, hunting, the moon, and the natural environment. She is the daughter of Zeus and her twin brother is Apollo. She is protector of the young presiding over child birth. In contemporary society Artemis may also be a boys name. Gaea (GAY-ah) is the Goddess of Earth and mother of all the Titans. Rhea (REE-ah) was the wife of Cronus. He swallowed all their children. She however tricked him into swallowing a rock saving her son Zeus. Lucky escape! Her names means flowing. Phoebe (FEE-BEE) is the titan of the moon. The feminine version of Phoebus, meaning bright. Thea (THEE-AH) is the goddess of whom light derives from. She is the mother of Helios (sun), Eos (dawn), and Selene (moon). Atlas (AT-LESS) was forced to hold the world upon his back as he supported Cronus over Zeus. Holding the world was a punishment by Zeus. His names therefore has connotations of strength and power. Metis (MEE-Tis) was the titan of the fourth day as well as planet mercury, presiding over the power of wisdom and knowledge. Zeus ate her as it was heralded that her second child would replace him. This name has also be known to be a boys name. Demeter (dih-mee'-tur) is the goddess of corn and grain, overall the earth, fertility and agriculture. Her daughter Persephone was kidnapped, she therefore put a curse on earth to make the plants die. It was agreed Persephone would spend six months in the underworld, during this time her mother grieves for her- winter. Persephone (per-SEHF-ə-nee) is the daughter of Demeter and is the goddess of spring time. She was abducted by Hades into the underworld where she became queen of the underworld for six months a year. Eros (E-Ros) the son of Aphrodite is the God of Love. His weapon the bow and arrows, stunning coups into uncontrollable love. Eris (E-Ris) the Goddess of Discord was often snubbed by other Gods. She followed her brother Aris into battle with son strife. The Trojan Horse was a result of of not inviting Eris to a wedding. My favorite of these names are probably Hera and Athena -- But one thing I wanted to mention is, I've always pronounce Apollo like Ah-PAH-low. That's how it was always pronounced in Social Studies, movies, stuff like that, but perhaps I'm mistaken.